A couple pushing strollers walk past the Yeshiva Kehilath Yakov School South Williamsburg. 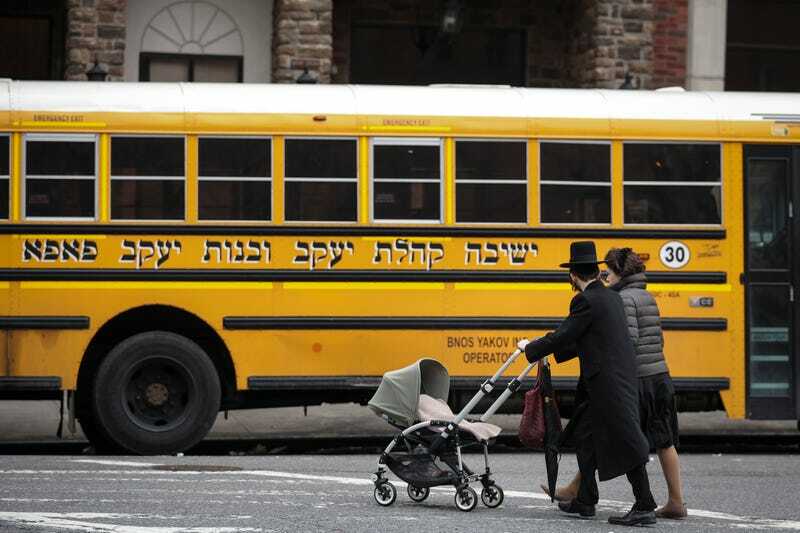 On Tuesday morning, responding to a growing and serious measles outbreak in largely Haredi Jewish areas of Brooklyn, New York City mayor Bill de Blasio declared a public health emergency. He also ordered all unvaccinated individuals in those neighborhoods to receive a measles vaccine, saying in a press conference, “This is the epicenter of a measles outbreak that is very, very troubling and must be dealt with immediately.” In the midst of an ongoing series of measles outbreaks across the U.S. and a renewed wave of anti-vaccination misinformation, the response to the order is probably going to be very, very loud. As of April, there have been 285 confirmed cases of measles in Brooklyn and Queens, most of them, the city says, involving people in the Orthodox community. A huge concentration of those cases are in Williamsburg, and the mandatory vaccination order covers the four zip-codes in that area. (The order is not just confined to Orthodox Jews.) Earlier this month, responding to a similar measles outbreak in Orthodox communities in Rockland County, New York, the county commissioner there issued an emergency order barring unvaccinated children from schools and other public areas for 30 days; that order was halted on Friday by a temporary court ruling. Requiring vaccines in an emergency situation is a highly unusual but not unheard-of step, says Dorit Reiss, a professor at UC Hastings and an expert on vaccines, law and policy. In an interview with Jezebel, she said that while it’s well within their legal rights as a city, New York City’s order is one of the broadest she’s seen in years. The last time a vaccination order this broad was issue was in Pennsylvania in 1991, Reiss says, an outbreak that centered on the Faith Tabernacle Congregation. The city’s health department won a court order to vaccinate Faith Tabernacle’s children after many families refused, but by the time the legal battle was over, it was arguably too late: only nine children were ultimately vaccinated, NPR reports. Nine more died, including six from Faith Tabernacle. The same discussions about personal beliefs versus public health will ensue as a result of de Blasio’s orders, Reiss says. She has a complex view on the subject, despite being a strong public advocate for vaccines (to the point that she’s been viciously harassed by the anti-vaccination movement for years and falsely accused of being a paid shill for Big Pharma). Reiss spends enough time studying and responding to anti-vaccine propaganda to know that anti-vax groups and websites will use de Blasio’s order as ammunition—proof that a tyrannical government really will crack down on anyone who opposes vaccines. What Is a &apos;Female-Owned&apos; Tattoo Shop, Anyway?